today is our first official day of school! a few weeks ago i put our daily schedule on paper. after months of summer play and unscheduled education, i knew that we would need a routine to get into school mode. as it was, there was no time alotted for math or science. i was thirsty for routine. i looked at our typical day at home. i paid attention to the time of day BigGirl was most alert and ready to learn. i noted the natural flow of the day- the times she likes to have breakfast, snacks, lunch, the time of day she begs to play outside, and the time of day she needs to rest. i accounted for dinner prep and bath time. and i put it in writing. then, i added in schoolwork around the normal day-to-day things, assigning each subject no more than 30 minutes. why? two reasons: 1) that's about how long BigGirl can stay focused on one thing at a time, and 2) on the Kindergarten-1st Grade level, it shouldn't take longer than that. to help BigGirl [and me] stay on task, i printed our schedule for me and made these time cards depicting what we do at what time for her. the time cards are posted on the refrigerator at her eye level. 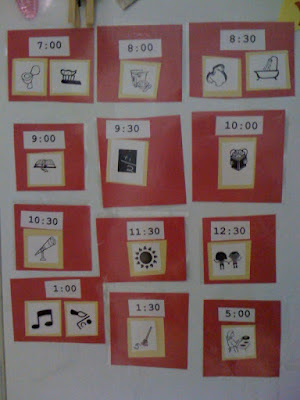 we practiced our new/modified daily schedule for the past 2 weeks and it's working out great. so far. so we'll keep it! 6:30-7:30 BigGirl wakes up, brush teeth/potty, coloring/independent work. 8:30 Everyone bathes and gets dressed. *i am not crazy strict about what time we do what, but it sure helps to have a guideline. and being flexible makes it easy to fit in unexpected changes, such as running errands or field trips or "off" days. thanks to Joy for hosting Thirsty Thursday, where you can find even more homeschool- and educational-related blog posts.